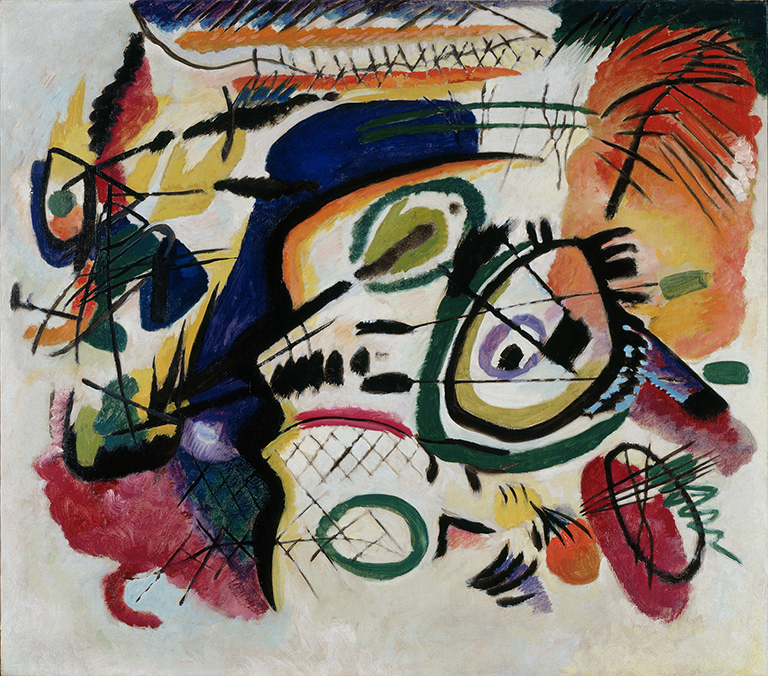 This study of the center section is one of numerous preparatory works for the last of the seven great compositions Wassily Kandinsky created between 1910 and 1913. Despite being generally recognized as the “father of abstraction,” Kandinsky began his colorful, rhythmic paintings with specific themes from the bible or from Russian folktales. In this active swirl of colors and forms, certain motifs suggest underlying New Testament themes such as the Resurrection and Last Judgment along with the Deluge from the Old Testament. A rudimentary figure in a boat at the left, a twin-oarred bark at the center right, and the central mountain heaved onto its side with the deep blue of sky or water behind it, are evidence of great natural turbulence. The complete finished Composition VII is in the State Tretyakov Gallery in Moscow. Fallone, Emma. From the Collection—Wassily Kandinsky's Fragment I for Composition VII. Milwaukee Art Museum: Under the Wings, June 30, 2015. http://blog.mam.org/2015/06/30/from-the-collection-wassily-kandinskys-fragment-i-for-composition-vii/. Lampe, Angela, Brady M. Roberts, and Wassily Kandinsky. Kandinsky: A Retrospective. New Haven, Connecticut: Yale University Press, 2014, cover (detail), pl. 38, p. 55, color illus. Milwaukee Art Museum News, September 2005, no page number, color illus. Andera, Margaret, Nonie Gadsden, Britt Salvesen, and Laurie Winters. Collection Guide: Milwaukee Art Museum. Milwaukee, Wisconsin: Milwaukee Art Museum, 2004, pp. 49 and 72, cat. 80, color illus. p. 49. Milwaukee Art Museum News, September 2003, no page number, color illus. Milwaukee Art Museum. Building a Masterpiece: Milwaukee Art Museum. New York: Hudson Hill Press, 2001, p. 123, color illus. p. 123, color details pp. 114 and 115. Dabrowski, Magalena. Kandinsky Compositions. New York: The Museum of Modern Art, 1995, p. 95, color illus. p. 95. Abe, Nobuo, ed. 20th Century Masters from the Milwaukee Art Museum. Translated and edited by Brain Trust Inc., Japan: 20th Century Masters from the Milwaukee Art Museum Catalogue Committee, 1994, pp. 34 and 132–33, cat. 11, color illus. p. 35. Journey into the Masterpieces: Adventures in Modern Art (20th Century II), Kodansha, Japan: 1994, pp. 146 and 150–51, color illus. p. 79, cat. 4–3. The Milwaukee Journal, April 3, 1988, Wisconsin, a Special Section, p. 11, color illus., NewsBank America’s Newspapers, http://infoweb.newsbank.com (accessed August 24, 2017). Goldstein, Rosalie, ed. Guide to the Permanent Collection. Milwaukee, Wisconsin: Milwaukee Art Museum, 1986, p. 127, color illus. p. 127. Röthel, Hans Konrad and Jean K. Benjamin. Kandinsky: Catalgoue Raisonné of the Oil Paintings. Vol. 2. Ithaca, New York: Cornell University Press, 1982, p. 472, cat. 474, b/w illus. The Bradley Family Foundation, Inc. Personal Selections from the Collection of Mrs. Harry Lynde Bradley. New Orleans: The Bradley Family Foundation, Inc., 1975, p. 29, color illus. Milwaukee Art Center. The Collection of Mrs. Harry Lynde Bradley. Milwaukee, Wisconsin: Milwaukee Art Center, 1968, cat. 12, color illus. p. 17. Milwaukee Journal, May 27, 1964. Milwaukee Journal, August 19, 1962, color illus. Guggenheim Museum of Art. Vasily Kandinsky 1866–1944. New York: Guggenheim Museum of Art, 1963, cat. 21, illus. p. 49. Milwaukee Journal, February 1, 1959, color illus. Grohmann, Will. Wassily Kandinsky: Life and Work. New York: Harry N. Abrams, 1958, p. 278, b/w/ illus. Van Gogh to Pollock: Modern Rebels, Masterworks from the Albright-Knox Art Gallery, Milwaukee Art Museum, June 18–September 20, 2015. Kandinsky: Compositions, Museum of Modern Art, New York, January 25–April 25, 1995; The Los Angeles County Museum of Art, Los Angeles, June 1–September 3,1995. 20th Century Masters from the Milwaukee Art Museum, Isetan Museum of Art, Tokyo, July 2–August 9, 1994; Matsuzakaya Art Museum, Nagoya, August 11–September 4, 1994; Hokkaido Asahikawa Museum of Art, Asahikawa, September 10–October 16, 1994; Daimaru Museum, Umeda-Osaka, October 19–November 7, 1994; Chiba Sogo Msueum of Art, Chiba, November 26–December 29, 1994; Marugame Genichiro-Inokuma Museum of Contemporary Art, Marugame, January 14–February 26,1995. Journey into the Masterpieces: Adventures in Modern Art (20th Century II), Kodansha, Japan, 1994. Kandinsky and the American Avant-Garde, Phillips Collection, Washington DC, September 19–November 22, 1992; Dayton Art Institute, Dayton, Ohio, December 15, 1992–February 2, 1993; Terra Museum of American Art, Chicago, Illinois, February 13–April 25, 1993; Amon Carter Museum, Fort Worth, Texas, May 14–August 1, 1993. Vasily Kandinsky, 1866-1944, Pasadena, January 1–February 15, 1963; San Francisco, March 1–April 1, 1963; Portland, Oregon, April 15–May 15, 1963; San Antonio, June 1–July 1, 1963; Colorado, July 15–August 25, 1963; Baltimore, September 19–October 20, 01963; Columbus, Ohio, November 5–December 5, 1963; St. Louis, Missouri, December 20, 1963–January 20, 1964; Worcester, ?-April 20, 1964. A Selection from the Gifts and Collection of Mr. and Mrs. Harry Lynde Bradley, Milwaukee Art Center, February 10–March 4, 1962. French Paintings of the XXth Century, Fort Wayne Art Museum, Fort Wayne, Indiana, March 15–April 15, 1957.